Provide comfort for the family of Tyon Hill with a meaningful gesture of sympathy. Pickett Edwards, father, Mr. Enoch Hill, grandparents Mr. Frederick D, Pickett, Sr. and Mrs. Madeline Taylor Pickett. and Schuyler Douglas Pickett, Daphne, AL and many other cousins, relatives and friends. DIGNIFIED AND PROFESSIONAL SERVICES ENTRUSTED TO SMALL'S MORTUARY, 8822 COUNTY ROAD 64., DAPHNE, AL., 36526. To send flowers in memory of Tyon Diontae Hill, please visit our Heartfelt Sympathies Store. We encourage you to share your most beloved memories of Tyon here, so that the family and other loved ones can always see it. You can upload cherished photographs, or share your favorite stories, and can even comment on those shared by others. 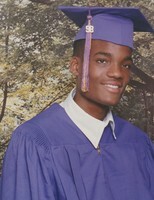 Provide comfort for the family of Tyon Diontae Hill by sending flowers. May the family of Tyon Diontae Hill please accept my sincere condolences hoping you find comfort in God's words at Acts 24:15 and Psalm 37:29. To the family and friends I express my sincere condolences for the loss of your loved one Tyon, I'm sure that he will be dearly missed by the many who loved him. Soon the terror of death will no longer exist. Almighty God Jehovah promises at 1 Corinthians 15:26: "And the last enemy, death, is to be brought to nothing." Yes we will enjoy life without the fear of us and our love ones dying. Also Isaiah 26:19 promises: "Your dead will live." Soon we will be reunited with our loved ones that have died. God has promised that soon we will live forever in a paradise earth without sickness, death, and suffering. May these promises from Almighty God Jehovah bring peace and healing to your grieving hearts. I am sorry for the loss of your loved one. God can help you at this difficult time. 2 Corinthians 13:4 tells us he comforts us in all our trials. May this thought give you solace.